Since the 1970s, there has been a decline of 4 percent each decade in the total volume of ozone in the ozone layer. Such depletion increases exposure to UV-B radiation, significantly affecting all inhabitants of the biological world. Overexposure to UV-B has been associated with an increased risk of the skin cancer malignant melanoma, cataracts, and a weakened immune system. A reduction in crop yield is associated with changes in the distribution and metabolism of nutrients in plants, along with changes in developmental phases. Even marine life is affected, as evidenced by a reduction in phytoplankton production, the lowest level in the aquatic food chain. Damage also occurs during the earliest developmental stages of fish, shrimp, crabs, and amphibians. Ozone is a rare, naturally occurring gas, about 90 percent of which is found in a layer of atmosphere that begins 6–10 miles (10–17 kilometers) above the Earth’s surface and extends up some 30 miles (50 kilometers). This atmospheric layer is the stratosphere, and the ozone found there is called the ozone layer. Sunlight is the most common form of ultraviolet (UV) radiation, and ozone absorbs UV-B radiation so that only a small fraction reaches the Earth’s surface. Associated with ozone depletion has been a one-third decrease in the ozone layer above the polar caps, called the ozone hole, during the Antarctic springtime (September through early December). The primary causes of this depletion have been attributed to chlorofluorocarbons (CFCs) and hydrofluorocarbons (HCFCs), formerly used as propellants in spray cans, refrigerants, in foam and insulating products, and as electronic solvents. These volatile substances are carried to the stratosphere where they are broken down by UV radiation, releasing chlorine atoms, which react with ozone (O3), causing its breakdown and depletion. International awareness of CFC’s role led to the 1987 adoption of the Montreal Protocol on Substances that Deplete the Ozone Layer, an international treaty calling for a reduction in the use of CFCs and other ozone-depleting compounds; as of 2010, there were 190 nation signatories. It has been estimated that if CFCs cease to be used, normal levels of ozone will be restored by 2050. SEE ALSO: Global Warming (1896), Food Webs (1927), Silent Spring (1962), Sustainable Development (1972), Skin Color (2000). 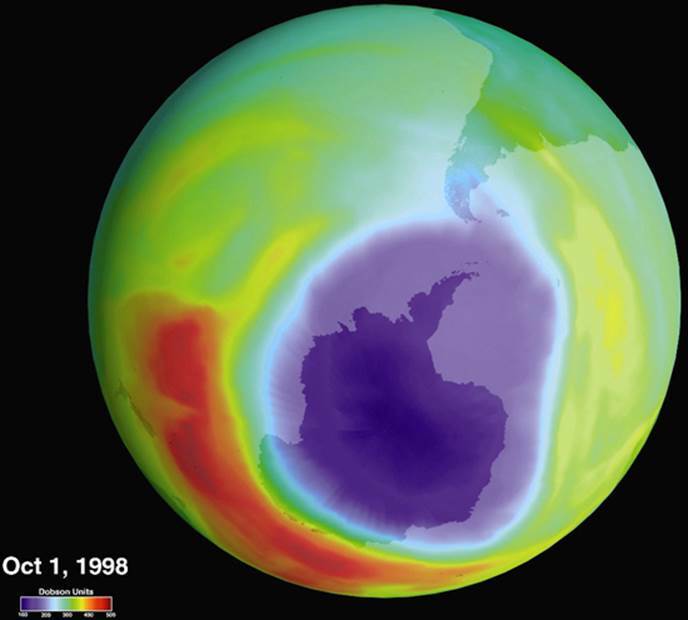 In this NASA satellite image from October 1, 1998, the hole in the ozone layer over Antarctica is shown in purple.